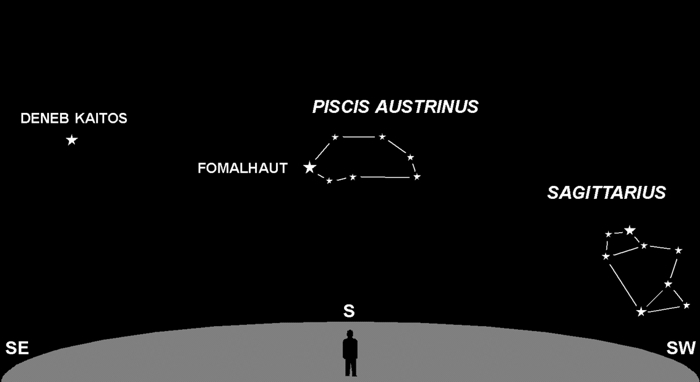 Fomalhaut is a star not unlike our own Sun, yellow-white in color, about the same size, but 22 light years distant in the faint constellation Piscis Austrinus (aka the “Southern Fish”). It doesn’t look much like a fish to me, and most of the stars in this group are very dim, shining at magnitude +4 or +5. But Fomalhaut shines brightly at magnitude +1.2. Look toward the south, about 25° above the horizon — it’s the brightest star in that general direction. The name “Fomalhaut” means “mouth of the fish” in Arabic. Many of the constellation and star names in use today were first assigned by astronomers from the Middle East thousands of years ago. When I look at Fomalhaut and consider how similar it is to our own Sun, I often wonder if there might be other astronomers out there looking back at us. Astronomical research over the last decade suggests that most stars do have planets. Whether those planets also have intelligent life is one of the really big questions.